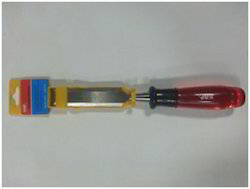 16-089: 1/2" X 7 3/4"
: 3/4" X 7 3/4"
: 1" X 7 3/4"
We offer 3 Piece Wood Chisel Set. We are dedicatedly engaged in offering a commendable range of Firmer Chisel that is available in various specifications. Being quality-centric firm, we are engaged in presenting a high-class range of Wood Chisel Set. 16-089 1/2" x 7 3/4"
We have carved a niche amongst the most dominant names in this domain, engaged in offering Wood Chisel.